With the best will in the world, most fleet managers will have to accept that fuel theft is an inevitability when managing vehicles that need to be filled regularly with expensive fuel. Most operators have relatively tight security preventing outsiders from entering their premises, but fuel theft can significantly affect a company’s bottom line, and it can be so anonymous and difficult to track that you might not be aware of just how much it’s costing your company. In this article I want to walk you through the steps you can take in order to protect your fuel deposits, reducing the risk of theft and therefore reducing the overheads that you spend on fuel each week. If your warehouse, truck park or fuel storage area is poorly secured, you’ll be inviting theft and dishonesty within your company. I’m a firm believer in preventative security – clearly displaying cameras with night vision in order to discourage acts of theft in your company. Installing security hardware and software can be a costly one-time payment, but it’s likely to pay off, with your cameras preventing thieves from attempting to siphon off the fuel left in trucks overnight. Your other option in terms of security is to hire a guard (or guards) to keep a watch over your equipment and vehicles throughout the day and at night especially. Again, you’ll have to part with a little cash for their wage, but it will almost certainly be less than the cost of the fuel you might be losing to theft. If your external security is compromised and a member of your staff, or an outside thief, manages to access your fuel storage, your final ring of defence should be fitting anti-siphoning devices and alarms on all of the vehicles and tanks that you own. Of course, this is also preventative. Anyone who sees an electronic sensor on the side of a fuel tank is likely to understand that an alarm will sound if they attempt to extract fuel. If someone is foolish enough to give it a go anyway, opening the tank to drain it will sound an alarm, discouraging the thief from further extraction, which means that you’ll barely lose a drop of precious fuel to those trying their luck on your fuel tanks. You might be imagining the groans of your trucking staff on your introduction of fuel consumption checks – given the fact that fuel isn’t necessarily consumed at a uniform rate across drivers and routes – but it’s a good way of indicating where you might be losing cash on fuel. Nonetheless, I’ve seen companies enact this kind of monitoring system with the result that drivers are more careful with their fuel consumption, and fuel is saved whether or not it’s siphoned off by thieves every now and then. Therefore, you should draw up a system, whether manually or automated with fuel management software, to help you understand what should be left in the tank after each fill-up of your fleet’s tanks. You company accounts are where you’ll spot inaccuracies and losses. Go one step further and bring in a fuel management system that helps you keep tabs on all of your vehicles and the fuel they’re expected to have burned through each day. Fuel management systems won’t cost you human labour in analysing statistics and crunching numbers; they will work everything out for you in a cost-effective and time-saving way. The benefits of installing systems such as these go way beyond alerts to tell you when fuel fraud and theft have occurred in all areas of your fuel consumption. You’ll be able to break down exactly where you’re losing more than you’d expect to be losing so that you can question members of staff about anomalous fuel statistics after a drive. 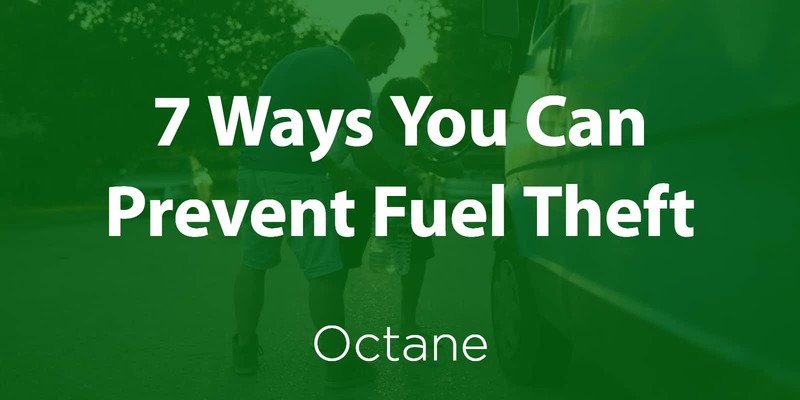 While the most obvious and sometimes the most common way to siphon off your company’s stocks of fuel is to directly hit the fuel tanks of either your fleet or the tanks that supply your fleet, there are other ways your employees can steal fuel from your company. If you have been monitoring the fuel levels in your company, you should probably be able to detect and determine who is being dishonest within your company, and which results are a cause for concern and a severe loss for your company week in, week out. Added up this presents a seriously massive economic hit for the world’s fleets, but it’s one that you should be fully aware of to counter it effectively. Having been in these meetings myself, I know that they can be just as effective in cutting employee theft than anything else. Hold a meeting with all your drivers and workers, and announce that you’ve detected some fuel theft. Say you know it is within your staff. The effect of being anonymously called out will shame those thieves in your numbers and will send a clear message to your staff as a whole: we now have our eyes on you. For most employees, helping themselves to a little extra fuel is not worth losing their job over. I’ve pointed in this article to a number of preventative measures that you can take to reduce your fuel losses through theft and fraud. The most effective of all of these is to install a comprehensive fuel management system that’ll limit your fuel losses and will provide you with accurate data on each and every tank that you possess. Fuel is one of your significant overheads when managing a fleet – and small weekly savings can really add up over the course of a year. So go ahead and follow the tips I’ve provided above to save your company cash. Jason Unsworth is a Director of Octane Holding Group Ltd and has worked in the refuelling system services industry for over 20 years. Jason is responsible for all operational aspects of Octane Holding Group Ltd. and when he's not working he has a keen interest in motorsport , riding his motorbike and enjoys spending time with his grown up children.